Mario Party 9 is the 12th entry (in America) in the Mario Party series, which I consider to be one of the best not-actually-a-Mario-game series to carry the Mario branding. For the unfamiliar, they are “party games,” obviously, in which you play a Mario-themed board game filled with mini-games in which the players compete for Coins/points. And like any good board game or board game simulator, if played properly you can and will hate all of your friends by the end of the game. Most of the games revolve around collecting the most Stars, which you must pay Coins for, in the number of turns allotted. The primary method of gaining Coins is via the mini games and certain spaces on the board. All of this makes for a pretty fun time, at least with friends. Unfortunately almost none of that applies to Mario Party 9. This game bucks at the trends of it’s forebears, much to it’s detriment. First of all, the entire party travels the board together in a… vehicle of some design. Thus virtually eliminating a good portion of the purpose and fun of board games, getting ahead of your friends. You still have turns, during which your character takes their turn at the wheel of your whatever-this-level-has-stuck-you-with. Furthermore the actual goal of the game has changed, as you no longer collect Stars or Coins with which to buy them. Instead you collect Mini Stars, which are acquired in the same manner as Coins were in previous installments, while making your way to the end of the board. That’s right, they switched the boards from being circular/cyclic to a Start-to-Finish format, and at the same time eliminated your ability to reach the ending first– winning being done via Mini Star count. If that sounds like a horrible idea for a board game, or in this case a board game simulator, that’s because it is. Adding to the list of bad ideas, the number of items you have at your disposal has been reduced– in part due to place-changing items being rendered pointless. Now the only items are special dice, of the Low Roll (die with only 0 and 1 or 1-3 on the faces) or High Roll (10 sided die and die with only 4-6 on the faces) variety. Finally, the variety of level/board gimmicks has been replaced with only one mechanic, where an ‘event’ of some sort will happen to the person currently in charge of the vehicle, usually resulting in the loss of half your mini stars (a bob-omb counting down to explode, for example). This only leaves the Mini Games to be the saving grace of this malformed sequel. And yet, the game disappoints once more. Not to say that the mini games are really bad, as they are indeed the best part of the game– not that that’s saying much. They are, however, mediocre and fail to live up to some of the greats from past games in the series. All in all this game is a disappointment, in case you couldn’t guess. 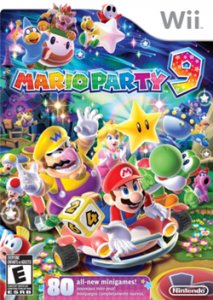 It does not live up to past entries, such as Mario Party 8 and Mario Party 5, both of which I do recommend picking up. I sincerely hope that these changes do not stick with the series.